6.38 points at 13 votes (rank 545). Design in isometric perspective with many shades and details. 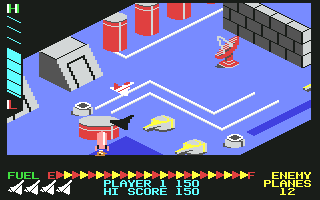 The game area is scrolled from upper right to liower left. By this a virtual 3D-effect is created. The flying height can be recognized by the size of the spaceship and the distance to its shadow. After crossing the asteroid town you get into free space. 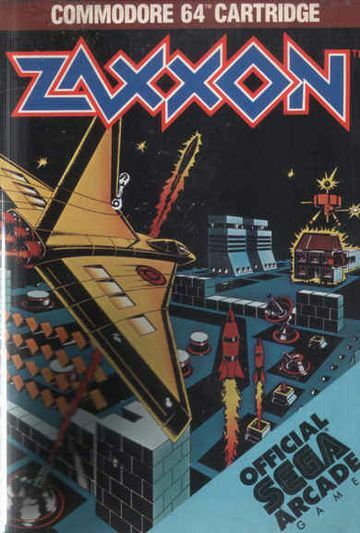 Here you will encounter hostile space fighters and satellites. The size of the space fighters indicates their flying height. The smaller they are the lower they fly. 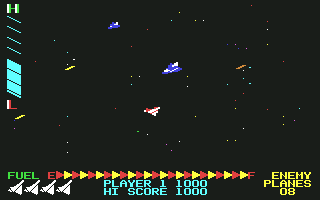 The number of sace fighters to be destroyed is shown in the lower right corner of the screen (Enemy Planes). If you destroy all hostile soace fighters, you will get a bonus of 1.000 points. The Version by "TRIAD" ha a trainer with the following options: unlimited lives, unlimited fuel, invulnerability. Additionally, the manual was integrated. 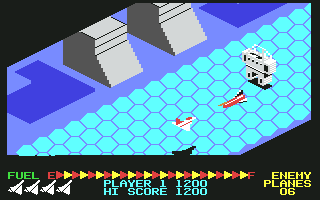 H.T.W: "In contrast to the version by Synapse the graphics look a bit better subjectively. 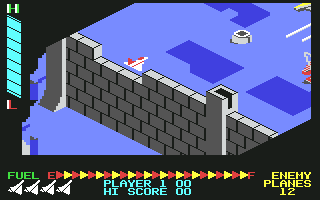 In return, the scrolling judders a bit and the sideways movement of the spaceship looks irregular. 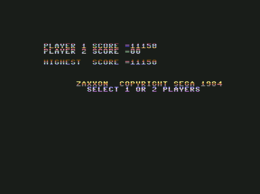 It is a pity, that neither of the two versions has a saveable highscore list.". This page was last modified on 18 February 2019, at 21:19.